When you end a trip with a bang, you just can’t wait for the next one. That summarises the last couple of hours of my GRK trip with Shreeram MV and Jugal Tiwari. The last leg was spent at the beach near the Modhva Fishermen’s Village. It was low-tide when we reached there and the water was starting to come in. From the minute we spotted the Eurasian Curlew, I knew that I was in for a treat. 2 hours of flew by in a flash and I was heading back home with some nice images of a dozen lifers – Pallas’s Gull, Brown-headed Gull, Slender-billed Gull, Lesser Sand Plover, Grey Plover, Bar-tailed Godwit, Eurasian Curlew, Terek Sandpiper, Western Reef Egret (white morph), Sanderling, Ruddy Turnstone and the Eurasian Oystercatcher completed the haul. And I shouldn’t forget, a completely wet set of clothes (from lying at the edge of the water) and sand in parts that I didn’t know existed!! There were just too many highlights of these couple of hours. 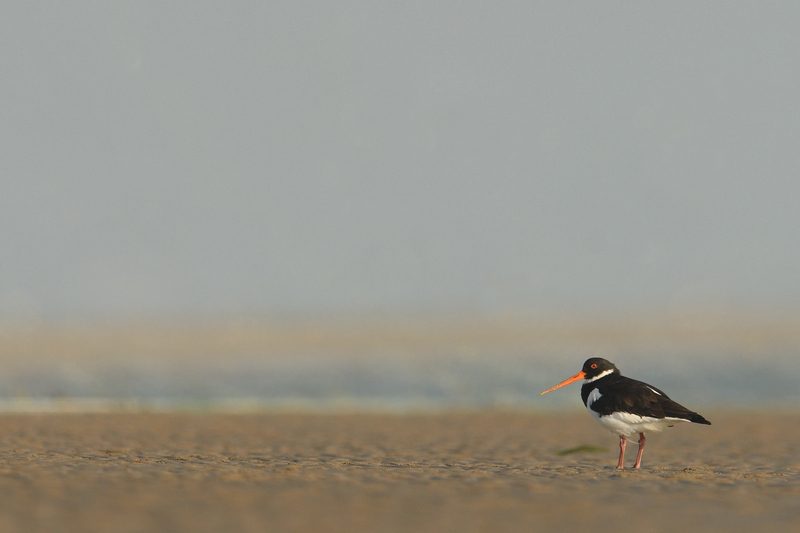 But if you were to press me for one, I would go with the sighting of the Eurasian Oystercatcher. For one, its name evokes thoughts of pearls and of being hard to lay ones hands on. And true to its name, it was quite difficult to get decent pics of. Any close than about 40-50 mts and the bird would either scurry away to maintain this distance or fly another 50 away so you have to start all over. Thanks. Absolutely a beauty, with the matching red eyes and bill. Pity that he didn’t let me get any closer for some better portraits.